The researchers used electroencephalography (EEG) headsets which recorded electrical activity from neurons firing in the brain to convert the words ‘hola’ and ‘ciao’ into binary. The recent development of brain-computer interfaces (BCI) has provided an important element for the creation of brain-to-brain communication systems, and precise brain stimulation techniques are now available for the realization of non-invasive computer-brain interfaces (CBI). 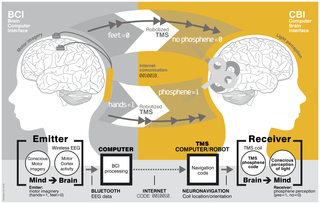 These technologies, BCI and CBI, can be combined to realize the vision of non-invasive, computer-mediated brain-to-brain (B2B) communication between subjects (hyperinteraction). Four healthy participants (age range 28–50) were recruited, and their informed written consent was obtained. Of the four subjects, one was assigned to the BCI branch (the emitter - Subject 1) and the other three to the CBI branch of the experiments (i.e., as receivers - Subjects 2, 3 and 4). I am afraid of such technologies!